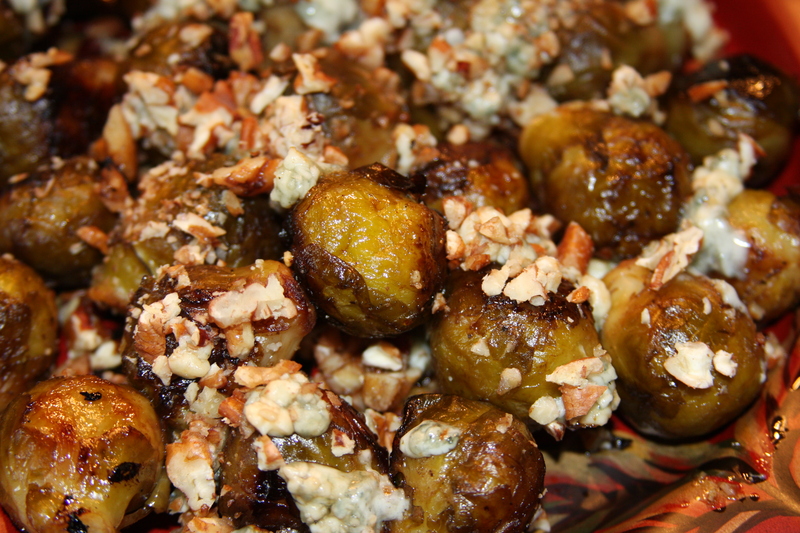 So, here’s the deal about Brussels Sprouts. Until about 5 minutes ago I HATED them. About 6 years ago I tried them at a dinner party during Christmas for the first time. They were DISGUSTING. I mean, really, really, really, gross. Like, so bad that I secretly and non-nonchalantly spit them out in my napkin. I never do stuff like that. Fast forward to the last year. 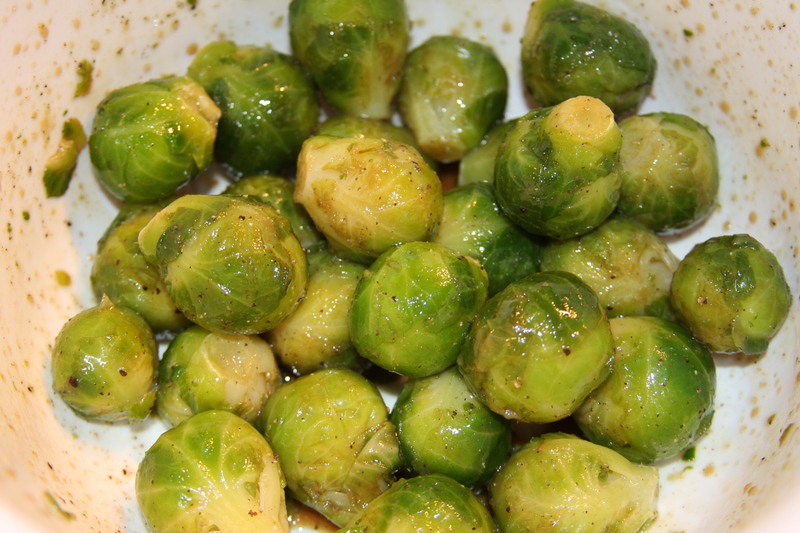 I have been seeing Brussels Sprouts everywhere and people talking about just how amazing they are. Every time I heard/read/saw that kind of stuff being said, I would be a little sick to my stomach. My cousin’s wife (who I talk about in this post) has been trying to convince me to pour on some balsamic and roast them in the oven for about a year now as well. I just wasn’t sure I wanted to go there, but a couple of weeks ago I saw frozen veggies on sale and so I bought a bag of them to try. When I got brave enough. I got this really amazing organic blue cheese at WF a couple weeks ago and I have been eating it almost every day in a salad with spinach, balsamic and pecans. I’m addicted to it. In fact, I probably need to post that quick recipe too. Anyway, I had this thought today that it would be something I would like to try on these little green sprouts. HOLY MOLY! These babies are good! 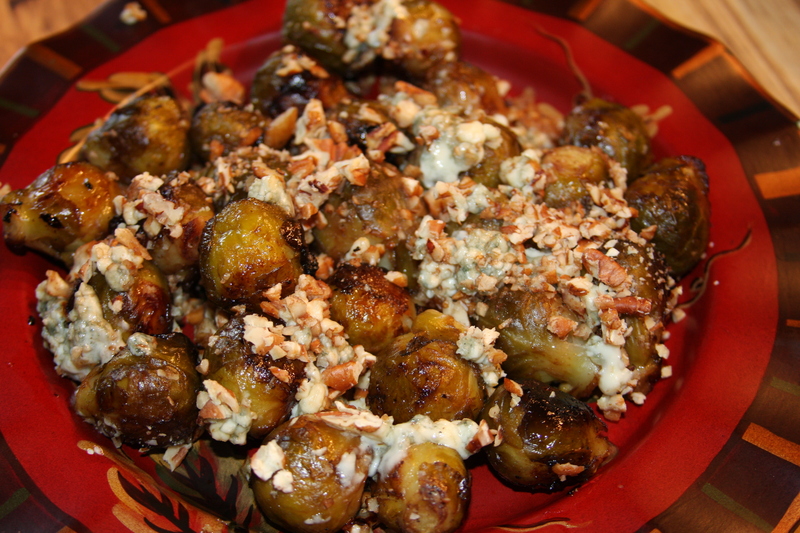 I am totally taking a ride on the Brussels Sprouts train from now on. I am already thinking of some other recipes that would be good. Maybe that strawberry balsamic dressing I made for a salad a couple weeks ago would be amazing too. I make my kids try everything once, if they really don’t like it then I don’t make them eat it again. I just think that they have to try everything at least once, you never know if you will like it or not until you try. I made them both try these and they couldn’t get to the trash can in the kitchen fast enough to spit them out! HA! It was pretty funny seeing the looks on their faces. My daughter (3) spit hers out and then did a dance around the kitchen saying, “pew, grossy, pew, ugh, that was awful. Please, I need a drink!” I couldn’t stop laughing. So, maybe this isn’t for your kids (giggle). 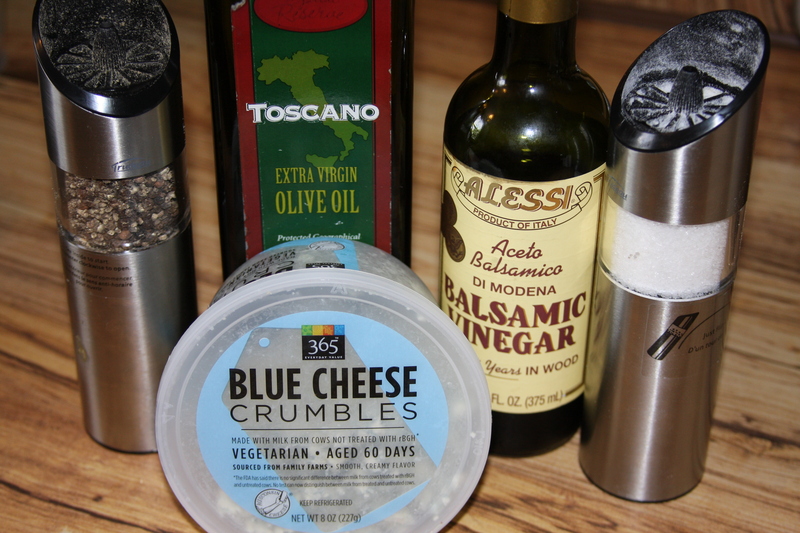 But if your a grown up and you love the taste of blue cheese, balsamic and pecans…this is for you! I forgot the pecans in this picture. 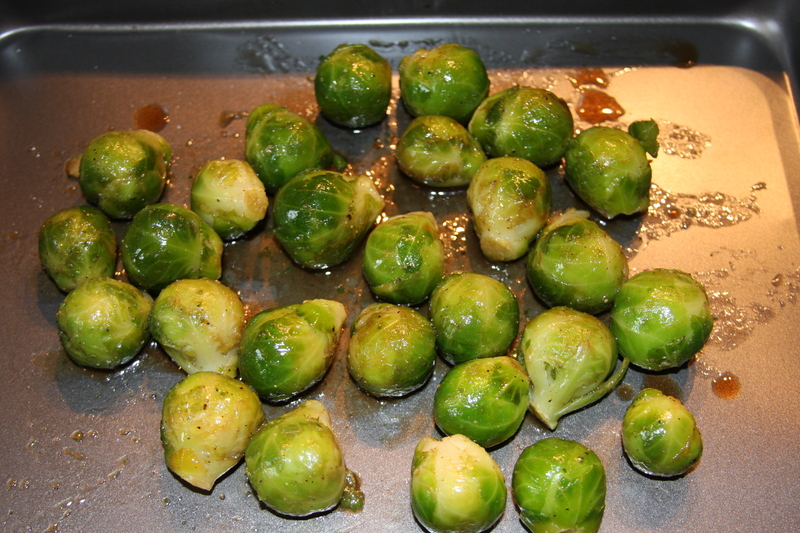 I used frozen sprouts, so I just let them thaw out first. Put them in a medium sized bowl and toss them with the salt, pepper, balsamic and olive oil. Then place them on a baking sheet and put them in the oven for about 30 minutes. 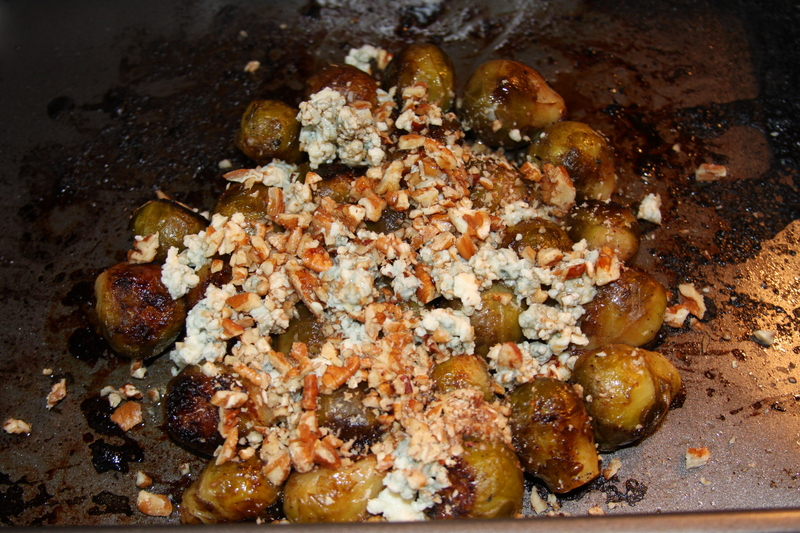 Take them out of the oven and add the blue cheese and pecans. Then stick them back in the oven for about 4-5 more minutes, until the cheese melts a little. Serve them up and enjoy! This entry was posted in Appetizers, Dinner, Gluten-Free, Lunch, Recipes, Sides, Snacks, Vegetables, Vegetarian. Bookmark the permalink. I’ve recently made the same revelation! Never had a brussel sprout in my house until I got them in our organic share. Of course I couldn’t waste them, so, having heard the raves about roasting them (and broccoli- you gotta try it) I drizzled evoo and sea salt. Erin and I ate them up! Still couldn’t convert the male members of the family, but that’s no surprise. Someone else suggested EVOO, Shallots and bacon! Can’t wait to try that one next! Yea, I knew there was no way Robert would ever eat them! !